Taunton Women’s Aid are working in Halcon, in partnership with Police, Children’s Centre staff and Taunton Deane Housing staff, to provide a weekly drop-in ‘Chill and Chat’, for women in the local area. Read our January 2014 Supporter's Newsletter here. 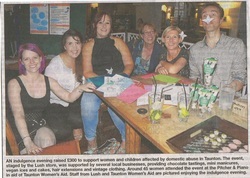 An indulgence evening raised £300 for Taunton Women's Aid. The event was organised by the Lush store and was supported by several local businesses. Local businesses are being asked to put up the body check posters in their offices to help people identify the early warning signs of unhealthy relationships and make it easier for people to ask for help and support. A kind donation of £200 was received from Mr and Mrs Ives, towards TWA’s preventative and educational work within primary and secondary schools within Taunton. Many thanks to Paolo and Meryl and all the customers at The Flintlock Inn, who raised £27.03, from donations to the TWA collection tin. These funds will help TWA to support women and children affected by domestic abuse. Thanks also to Catherine Ashworth, for organising the collection tin donation. TWA attended the International Women’s Day event in Wiveliscombe, on Saturday, 20th April 2013. It was a great event, with lots of workshops for girls and women to attend. TWA provided hand massages and showed people how to make lip balms, both of which were well received! Thanks to everyone who organised and took part and to all those who attended. Thanks to the Ladies of the PCC in Kingston St Mary, who organised a Lenten Lunch, on Saturday, 9th March 2013, from which £200 has been donated to TWA. These funds will support TWA to launch a new women’s support group in Taunton. Many thanks to all those who gave their time to the event and all those who attended and supported the event. 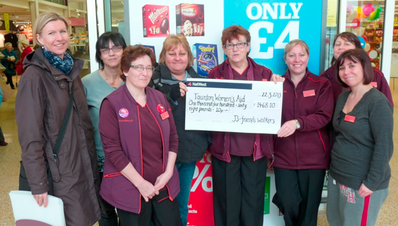 Fiona Davies, from Taunton Women’s Aid receiving a cheque for £1,468.10, from J Sainsbury & Friends Walkers, who completed a sponsored walk & received match funding from Sainsbury, Hankridge. 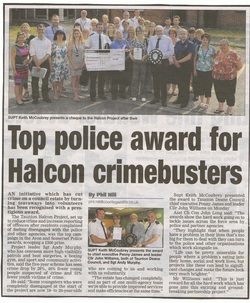 Pictured (left – right) Fiona Davies, Clara Bixby Harper, April Manley, Elaine Hosegood, Rosemary Grabham, Mel Courage, Helen Marshall & Hannah Edge. The funds raised will help to provide community based, group support to women & children, in Taunton, affected by domestic abuse. 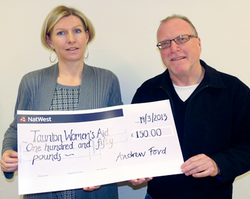 Fiona Davies, from Taunton Women’s Aid receiving a cheque for £150, from Andrew Ford. Andrew, a postman covering Stoke St Gregory, raised £150 in sponsorship for completing the 10 mile ‘Tough Ten’, a multi-terrain race, covering beach, road & woodland paths. The funds will help provide preventative and educational programmes within Taunton schools. Thanks to everyone who has already supported our Stay Safe Campaign. Don't want to miss out? Click here to see how you and your business can also Get Involved today!